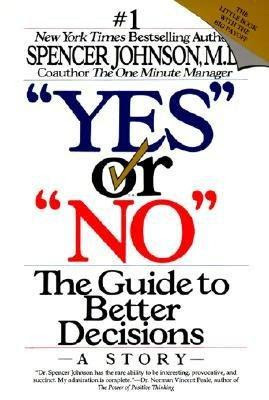 The book of the week was Yes or No by Spencer Johnson. Johnson is the same author of Who Moved My Cheese and The One Minute Manager. He uses a fictitious stories to illustrate a main idea. This particular story dealt with making decisions. Learning how to make decisions is an incredibly important skill to master. It sounds silly to think of deciding as a skill, but some people have it and some people just don't. The more comfortable you feel making a decision, the more valuable you are to any organization. Most people in the world hate making a decision. Even in a social setting, you'll see a group of people trying to decide where they want to eat... and an hour later they finally made their pick. All the while, every person in that group is hungry and anxious. I think most people have been there and it is not pleasant at all. You may even notice those that are comfortable with making decisions correlate with high paying executive positions. Any organization can see value in someone that doesn't take extraordinary amounts of time to make a decision. Am I meeting the Real Need, Informing Myself of Options, and Thinking It Through? Is it a mere want or a real need? What information do I need? If I did 'x' then what would happen. Then what? Does My Decision Show I Am Honest with Myself, Trust My Intuition, and Deserve Better? Am I telling myself the truth? Does this feel right? What would I decide if I was not afraid? What would I do if I deserved better? What Is My Better Decision? With time and practice the map becomes second nature and you just end up making the right decision without much thought. This is ideal. But to get there you have to practice. Use the decision map here and correlate yourself with all those other high powered executives out there. The book was pretty good. It doesn't take much time to read, so if you don't like it you didn't waste much of your time. As always, If you have any questions on the book don't hesitate to ask. I would be more than happy to help anyone that wants it. Start Over and Finish Rich!